This hostel's biggest asset is the position, all our travelers tell us so. 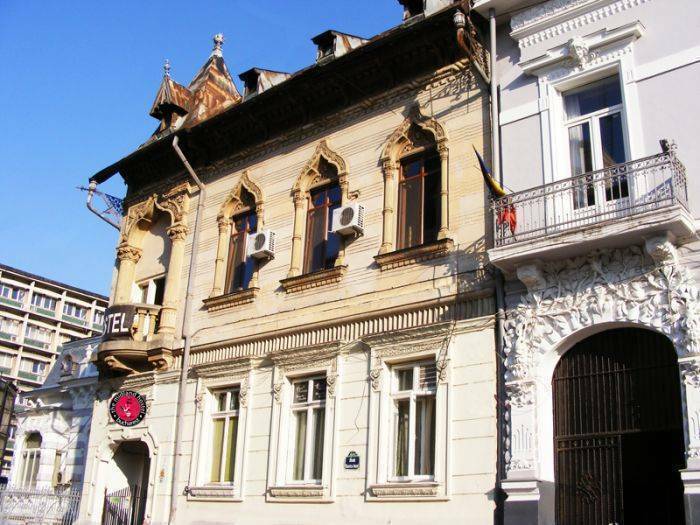 We're not only very central and just across the street from the French Embassy, but we're also very well connected too all the corners of the city: airport, train station, bus stations. At Piata Romana you find the metro, a lot of buses pass through there, there is a taxi parking, and the historical center is just 10 minutes away, to say nothing of the banks, restaurant, pharmacies, supermarkets, markets, etc. Explore Bucharest. Discover Romania. Stay with us in our Hostel. We are very proud of the hostel itself, too. It has character, the rooms are big and aired, the lounge is huge, its a quiet house where your sleep will be very good and you will recover from all the roads you have traveled and all the Bucharest clubs that have kept you awake until 8 o'clock in the morning :) The buffet breakfast we offer is substantial, the fresh coffee will jump-start your day and the road lies before you towards new sights and new adventures. 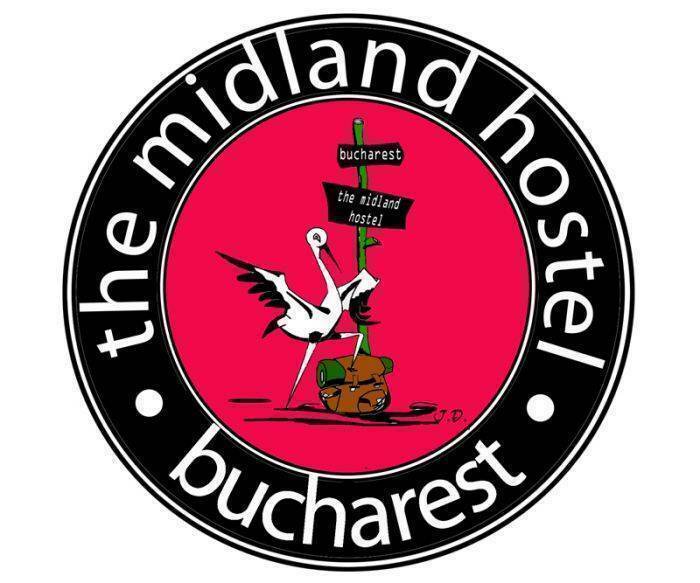 The Midland Youth Hostel is to be found in PIATA ROMANA, one of the 3 central squares in Bucharest ( Piata Romana, Piata Universitatii and Piata Unirii) which means that everything you need is conveniently placed AROUND the hostel – a fruit and vegetables market, 3 supermarkets of which one is open 24/7, banks, restaurants, clubs and bars, bus and METRO stops. The French Embassy is right across the street so there is no safer place in town. And still it is a remarkably quiet area even if it’s in the center! The 6 bed room and the 12 bed room give onto the street, but they are quiet, and accross the street there is the French embassy. They are fairly bright but we have black blinds for all the windows. 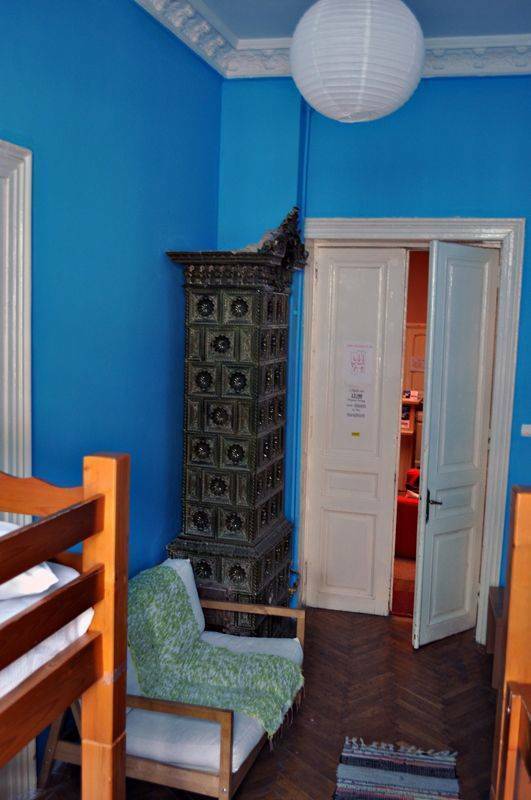 The 10 bed room gives onto the interior courtyard, so it is exceptionally quiet. 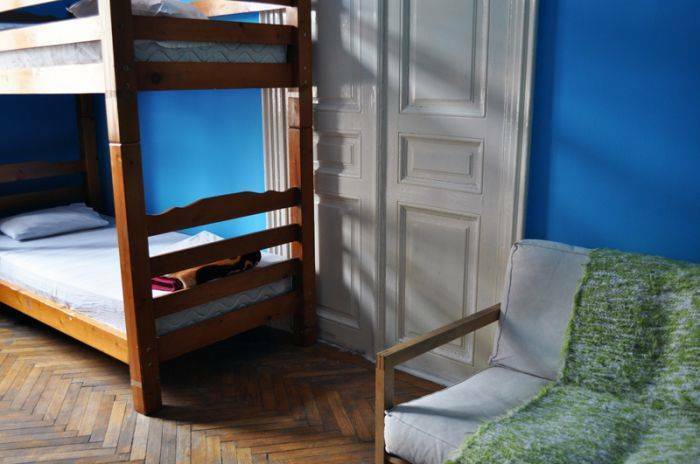 The beds are all wooden and they have thick mattresses. No-shows or cancels less than 24 hours before arrival will be charged the full amount of the first night of the reservation. By bus: 79, 86 (on the left side of the train station) or 133 (across the street from the train statation), get off at 'Piata Romana' stop. 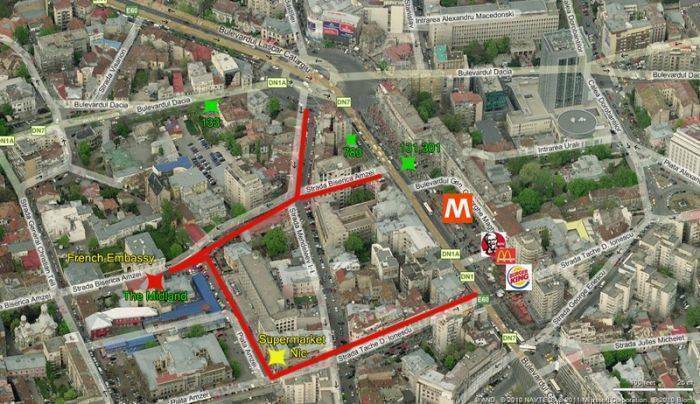 Keep walking forwards, at the first small crossing you come across, turn right, on the 'Mendeleev' street, then at the first crossing turn right again on 'Biserica Amzei' street and go to number 22 (past Tonka bar, across the guard booth, which is in front of the French Embassy). By Metro: from the 'Gara de nord' station one stop, to 'Piata Victoriei', change to the other line and go for one stop again, to 'Piata Romana'. From there, walk to the crossing, 1) cross the street on the opposite side ( left), 2) turn left at the next small crossing, 3) turn right at the next one, pass Tonka and get to the guard booth across the street from the hostel. By taxi: a taxi ride to here is less than 10 lei. Express bus 783, which you catch in front of the airport and get off at 'Piata Romana' stop. Keep walking forwards, turn right at the next small crossing and walk straight until you pass Tonka bar and then find the guard booth, we are across the street. Buses run from 5:00 till 23:00; the Express 783 runs non-stop, all night. You have to get the ticket from the booth, NOT on the bus. If you prefer a taxi - taxis are 1. 40 lei/km, anything else is a rip off. The price from the airport is around 40 lei. You can get reliable taxis not in front of the airport but out in the parking lot, or out closer to the main street. You can find more information about taxis on our website, in case you need one. LANDMARKS : the French Embassy, the Tonka bar. CHECK: the maps on our website (a bing map and a regular one). 3. use the landmarks if you want to ask for directions (the Tonka bar and the French Embassy).